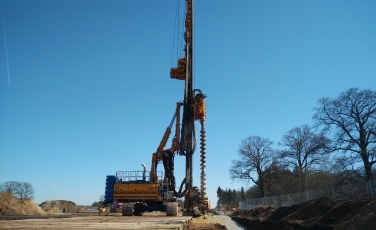 BAUER Funderingstechniek BV was recently contracted by Van Hattum en Blankenvoort bv., the main contractor, to design and construct soilmix cut-off walls for a new highway N18 between Groenlo and Enschede in Haaksbergen in the Netherlands. The client was Rijkswaterstaat. Bauer installed the mixed-in-place cut-off walls with a maximum depth of 19.5m until 2m into the impermeable clay layer, creating a permanent polder construction for the uneven road crossing. Bauer used the local ground as a construction material for the permanent cut-off walls. There was 14.500 m2 of walls, each with a maximum depth of 19.5m and a wall thickness of 0.55m. The project began in February 2017 and was completed in May 2017.